I remember back when I first went out on my own. You wrote a check for every bill. Gas. Rent. Car payments. Cell phone bills. Credit card payments. It was the only way to do business. Now we use electronic payments for just about everything. Our utilities are deducted each month. The same goes with the mortgage and cell phone payments. Just about everything is done electronically. Even so, we still use the dreaded checkbook. It’s inevitable! I was surprised to see that we’ve written twenty checks over the past six months. That’s almost a full book of checks. Grooming Places – 4 – My son and I go to a barber, and they don’t accept credit cards. So, we write a check. In addition, when my wife goes to get her nails or hair done, tips can’t go on a credit card. Kids Activities – 3 – Certain parts of things that our kids do seem to be easiest handled by check. Paying for equipment or such seems to end up being done by check. School – 3 – Buying a t-shirt through the PTO. Paying for a lost library book. Again, the school doesn’t accept credit cards so business is handled by check. Passport – 3 – My wife and I both got new passports, so there were fees to the government and the clerk’s office to get things handled. Painting – 2 – We recently had our house painted, and paid some up front and the rest upon completion. Both were done via check. 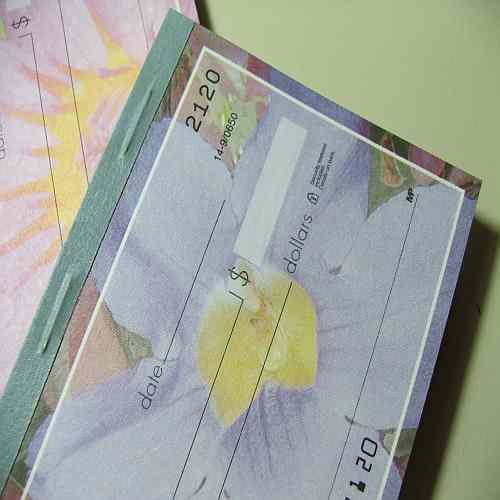 Family – 2 – We owed money for split costs on items to family members, and it was easiest to write a check. Gift – 1 – A gift for a family member’s Confirmation was done via check. License Tab Renewal – 1 – There’s no charge to use a credit card at the office, but they tack on a couple of bucks if you renew via mail with a credit card. So this just saved us time and money. City – 1 – We get an annual pass to our local beach, and it’s either cash or check. In a good many cases above, it seems like cash would work. But, in addition to writing less checks, we rarely buy things in cash. So, it seems the fallback is to use a check. Maybe a better option would be to keep some cash on hand and use those for things like the barber, family, gift, and city. This would have reduced our check count by roughly another 50%. But we really don’t like keeping a bunch of cash on hand around the house. I guess a check just feels like it’s a somewhat safer and easier alternative. Readers, how many checks do you write on average? For what do you still write checks? How has your usage changed over the years? Let me know your experiences and thoughts in the comments below. Thanks for reading. We write a check every few months. It’s usually something like your examples. If they take cards that’s my first move but not every place does and we usually don’t carry cash, so check it is. That’s the norm these days it seems. I remember getting my first checking account and checkbook (WAMU!) I was SO proud of myself! It happened a few months after I started my first job – I didn’t remember that I couldn’t legally open a checking account for myself until I was 18 but my first post high school job started at 17. I used to write checks for lots of things but honestly also made up reasons to use checks instead of cash. These days, we write checks for daycare activities, for the odd contracted job, and a few other odd things, but mostly we used up our last checkbook for the renovations we had going on all summer. Yeah, looking back I’m pretty sure I thought it was cool as well. My landlord recently changed their “policy” and no longer accept EFTs to pay rent. They wanted me to sign up for a website that allows me to pay my rent online – but it has a 2% fee per transaction! So no, I will not be doing that, thanks. Instead, I’ve reverted back to paying by cheque. Otherwise, the only time I’ve personally used cheques was when you need to provide a Voided one for direct deposit purposes. LOL, as long as they cash it I’d say you’re doing just fine.